Here we share a guide to Unlock Bootloader and Root Huawei Mate 10 and Mate 10 Pro. TWRP Recovery for Huawei Mate 10/Pro is not available yet but developers of FunkyHuawei shared a tool with that you can easily Root Huawei Mate 10 and Mate 10 Pro. This guide is divided into two parts first part show you how to unlock bootloader of Huawei Mate 10 and Mate 10 Pro, and second is to Root Huawei Mate 10 and Mate 10 Pro. Follow this guide to Unlock Bootloader and Huawei Mate 10 and Mate 10 Pro. If you are a Huawei Mate 10/Pro user, then you can easily unlock bootloader and Root Huawei Mate 10 and Mate 10 Pro without installing any TWRP or custom recovery. 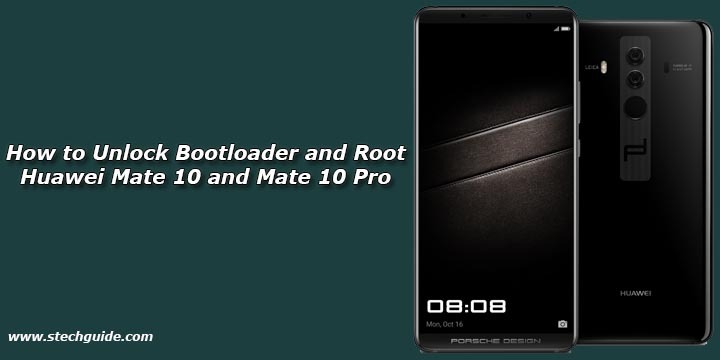 So here is the step by step guide to Unlock Bootloader and Root Mate 10 and Mate 10 Pro. Read the below note carefully before you go through the steps. Also, check the benefits of rooting from below. This method only works on Huawei Mate 10 and Mate 10 Pro. Rooting will void your phone warranty, and you won’t claim it back. To unlock Huawei Mate 10/Pro bootloader first you need to Request Unlock Code for Huawei Mate 10 and then follow simple adb commands to unlock the bootloader of Mate 10 and Mate 10 Pro. Download FunkyHuawei Huawei Mate 10 Rooting tool from above and extract it. So this is the complete guide of Unlock Bootloader and Root Huawei Mate 10 and Mate 10 Pro with easy steps. If you have any questions, then comment below.